ArtHamptons is produced by the Hamptons Expo Group of Southampton, NY. HEG also produces ArtAspen, Houston Fine Art Fair and Palm Springs Fine Art Fair. In total, over 50,000 motivated art lovers and enthusiasts from across the nation attend their fairs, annually. The company was founded 9 years ago by art collector Rick Friedman with the concept of bringing the thrill and excitement of a major international art fair to affluent regional markets, where attendees can conveniently make art acquisition decisions near their residences. First Look, July 2nd, 5:00-7:00 p.m. Opening Night Preview, July 2nd, 7:00-9:00 p.m.
Friday, July 3rd, 11:00 a.m.-8:00 p.m.
Saturday, July 4th, 11:00 a.m.-8:00 p.m.
Sunday, July 5th, 11:00 a.m.-6:00 p.m. Grants access to First Look & Opening Night Preview on Thursday July 2nd. Enjoy hor d’oeuvres and cocktails from 5-7 p.m. and complimentary wine bar from 5-9 p.m. Gain full access to the VIP Lounge and unlimited entry to the fair July 3rd-5th. Grants access to Opening Night Preview on Thursday July 2nd from 7-9 p.m. Enjoy complimentary wine bars, sparkling wine & specialty cocktails. Gain full access to the VIP Lounge and unlimited entry to the fair July 3rd-5th. Enter the International Photography Awards! Deadline June 30, 2015 - Submit Your Photos Now! Be recognized by receiving a coveted Lucie statue at the 2015 Lucie Awards Gala! Over $225,000 in cash prizes have been awarded to date. Submit your images now and be part of the most recognized event in photography! Terry Virts knows he’s lucky. The American astronaut recently returned from nearly seven months on the International Space Station, his second trip to space, which ended up lasting longer than expected. Virts, along with Russian cosmonaut Anton Shkaplerov and Italian astronaut Samantha Cristoforetti, was forced to stay board the Space Station for an additional month after an arriving Russian cargo vessel malfunctioned in April and later burned up in the atmosphere. During their 199 days in space, they conducted hundreds of scientific experiments and went on three spacewalks. Back on the ground after his return on June 11, Virts discussed, in an exclusive interview with TIME, his extended stay in space and where he finds the time to photograph the Earth amid a packed schedule. Virts, 47, is a Maryland native with a wife and two children. He was selected as a NASA pilot in 2000 and began training shortly afterward. This trip to space ended up some 15 times longer than his first, a 13-day mission on space shuttle Endeavour in 2010, and gave him more opportunities to show the rest of us what he sees. Throughout his stay aboard the Space Station—he traveled about 84 million miles since last November—Virts was shooting stills and videos that were later posted to Facebook, Twitter, Instagram and Vine with support from his colleagues on the ground. He captured lightning storms over the Himalayas, Mexico and the American heartland; overhead shots of the ice fields of Patagonia and painterly farms of central Brazil—all images that showed the natural beauty of the planet. On his last day, he finally managed to get a shot of the pyramids in Giza, Egypt. The Space Station orbits the Earth 16 times each day, at 17,500 mph. “Things go by so fast, or you look on—we have these computer maps where it shows where we are over the Earth—and you’re like, ‘Man, I just missed that target,’” he says. Other things can get in the way, too. The desired target could be too far in the distance, or maybe there’s weather above it, or perhaps the pass is in the middle of sleep or work. Beyond the technical aspect, there’s an artistic one, too: “Does it capture the feeling, and the emotion, in the sense of what you’re seeing? That’s a bigger challenge—the one that I like and the one that you just can’t do,” he tells TIME. When he thinks of Australia, for example, he thinks of red. “The outback is really red, it’s amazingly red,” Virts says. India and the jungles of central Africa are “hazy.” Beijing and Shanghai, the Chinese megacities, are “just brown,” due to pollution. Russia during the winter is “thousands and thousands of miles of white,” and the Bahamas are green and turquoise. “I want to go there,” he says, noting that his travel bucket list got much bigger. Interview by Shaul Schwarz and Jonathan Woods. See the trailer of A Year in Space, a multi-part documentary series produced by TIME’s Red Border Films and directed by Shaul Schwarz and Marco Grob. This Fourth of July, Shaw's Crab House will celebrate the red, white and blue at both Chicagoland locations!Loyal customers and new Shaw's diners alike will enjoy a landmark ½ Priced Oyster Deal in the Oyster Bar, the entire day. Guests will have the option of both an East Coast and West Coast oyster variety. Upping the ante further, from 4:00 p.m. to 6:00 p.m. the Schaumburg location will serve up plump, briny, hand-shucked bivalves for just $1 apiece! And because Shaw's opens all its oysters upon request, kindly limit per-person orders to two dozen at a time, so our shuckers can keep up! Also at Shaw's Chicago, the Fourth of July extravaganza will feature a New Orleans Crawfish Boil. 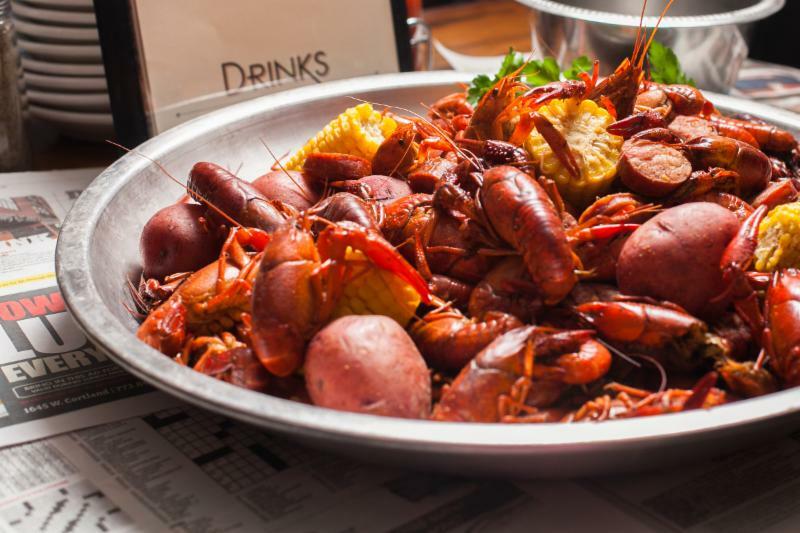 For $30 (plus tax and gratuity), guests can chow down on all-you-can-eat Crawfish with potatoes, sausage and all the fixin's (while supplies last). For more information please visit www.shawscrabhouse.com. Shaw's Crab House, a Lettuce Entertain You restaurant, features a 1940s-style take on the seafood dining experience, with retro leather banquets, polished wood floors, and Art Deco touches. The Oyster Bar provides a more casual setting for diners and serves up live music five nights a week at the Chicago location. Shaw's- The King of Crab! For more info, call 312.527.2722 (Chicago) or 847.517.2722 (Schaumburg), visit the website at www.shawscrabhouse.com, tweet with The Shaw's Mermaid at www.twitter.com/shellyfromshaws,or keep up on Facebook at www.facebook.com/shawcrabhouse and www.facebook.com/ShawsCrabHouseSchaumburg. The Chicago Department of Cultural Affairs and Special Events (DCASE) is pleased to announce that celebrity chef Graham Elliot will make a one-day appearance at the Taste of Chicago on Wednesday, July 8. This special treat for visitors will feature an opportunity to purchase his signature Lobster Corndogs throughout the day. Graham Elliot will appear at the Taste of Chicago Preview on Daley Plaza at noon today (June 24) to pass out a limited number of free samples of his Truffled Popcorn with Parmesan, Chive, and Sea Salt. Taste of Chicago is produced by the Department of Cultural Affairs and Special Events in coordination with the Illinois Restaurant Association, which manages food and beverage operations. The festival is sponsored in part by Aquafina, Bud Light, Chicago Tribune, Chicago Transit Authority, Communications Direct, CLTV-Chicagoland’s Television, Eli’s Cheesecake Company, Gallo Family Vineyards, Humana, Illinois Lottery, LaGROU Distribution System, Mariano’s, Metra, Pepsi, Pure Leaf, Shoreline Sightseeing, Southwest Airlines, TAIWAN EXCELLENCE, V103, WGN-TV, 101WKQX and 93XRT. The 35th Annual Taste of Chicago is July 8–12 in Grant Park with hours 11 a.m.–9 p.m., Wednesday–Friday, and 10 a.m.–9 p.m., Saturday and Sunday. For more information on the FREE admission festival, call 312.744.3316 or visit tasteofchicago.us. Join the conversation on Facebook at Taste of Chicago and follow us on Twitter, @TasteofChi (#TasteofChi) and Instagram, @ChicagoDCASE (#TasteofChi). Here's How To Save Money On Fourth of July Travel This Year! that a record 41.9 million Americans will travel this Fourth of July. Whether these individuals are heading to the top tourism destinations like New York, Florida, California, etc. or welcoming visitors into one of these destinations, there is no doubt that sightseeing at popular attractions will be on their agenda. If you want to help your audience make the most out of their July 4th travel plans — particularly when they are faced with seasonal increases in gas as well as moderately higher lodging rates and airfares according to AAA — you can tell them how to save on the cost of attraction access. is available for nine destinations across the U.S. and consumers can save as much as 55% versus buying their attraction tickets individually at the gate. And when you consider that July 4th travel usually means families with kids or groups of friends, this can mean significant travel savings in pricier destinations like Boston, Chicago, Los Angeles, Miami, New York, Oahu, Orlando, San Diego, and San Francisco. Bright Pink, a national non-profit on a mission to save lives from breast and ovarian cancer is excited to announce FitFest 2015 dates—the sixth annual event in Chicago on September 20th and the second annual event in Cleveland on October 11th. So, gather your friends and family and join Bright Pink to take breast and ovarian cancer awareness and transform it into life-saving action. Chicago’s fundraising event will take place at Fitness Formula Club: Union Station (FFC, 444 West Jackson Blvd) from 9:00AM-3:00PM. A modern day take on the more traditional walk or run fundraiser, FitFest is the perfect opportunity for men and women of all fitness levels – there is something for everyone. Participants will take fitness to an entirely new level by building their own perfect health & wellness day from a series of high-energy work outs led by FFC as well as The Dailey Method, Shred415, and WERQ instructors, to breast and ovarian health education, wellness workshops, beauty services, healthy treats and more. Additionally, Bright Pink is proud to welcome the Chicago Bulls/Sox Academy trainers who will lead participants through a series of basketball skills and drills workshops. Participate as an individual ($500 minimum), as a team with your friends or with your corporation ($5,000 minimum for a corporate team of 12). All money raised will fuel Bright Pink’s life-saving breast and ovarian health programs. In addition to making a difference, receiving life-saving education, and an overall unforgettable experience, all participants will be gifted with a swag bag filled. Photos and Bright Pink fundraising outcomes available upon request. for breast and ovarian cancer, reduce their risk, and detect these diseases at early, non life-threatening stages. Founded by Lindsay Avner in 2007, Bright Pink strives to reach the 52 million women in the US between the ages of 18-45 years old with this life-saving education. Put Awareness In Action™ at BrightPink.org. World music unites at the 17th Annual World Music Festival Chicago from September 11–22, 2015 at a variety of venues throughout the city. Celebrating the diverse music from nations across the globe, this FREE festival is produced by the Chicago Department of Cultural Affairs and Special Events and is the largest festival of its kind in the United States. Expanded to 12 days, this year’s festival features an Ethiopian New Year celebration, Ragamala, a celebration of Indian Classical Music, dozens of award-winning world music artists and more. Highlights of the 2015 World Music Festival Chicago include four concerts at Jay Pritzker Pavilion in Millennium Park by many of international music’s biggest names. On the first weekend, Red Baraat brings their one-of-a-kind bhangra funk and La Santa Cecilia plays its signature Latin sound to festival-goers on Saturday, September 12. On Sunday, September 13, internationally known Ethio-jazz artist Mahmoud Ahmed performs as part of the Ethiopian New Year celebration. Moroccan multi-instrumentalist Aziz Sahmaoui also performs on September 12 with his group, the University of Gnawa. During the second weekend of World Music Festival Chicago, the Jay Pritzker Pavilion at Millennium Park will host Nigerian afrobeat artist Orlando Julius along with Niger trance-rockers Tal National on Saturday, September 19. The final concert at Millennium Park features acclaimed Indian violinist L. Subramaniam and the legendary Pakistani ensemble, Fareed Ayaz, Abu Muhammad Qawwal and Brotherson Sunday, September 20. Throughout the week of September 11, World Music Festival Chicago celebrates the Ethiopian New Year with performances by some of the biggest Ethiopian artists. On Friday, September 11, a double-bill concert featuring Red Baraat and Ethiopian-Israeli cross-overartist Ester Rada takes place at Lincoln Hall (2424 N. Lincoln Ave.; Ages 18+). Also on Friday, Legendary Ethio-jazz artist Hailu Mergia performs at Martyrs (3855 N. Lincoln Ave.; 21+) and with Ester Rada who performs for a second time during the weekend at The Promontory (5311 South Lake Park Avenue West, ALL AGES) on Saturday, September 12. Ragamala: A Celebration of Indian Classical Music takes place at the Chicago Cultural Center on Friday, September 18, at 8 p.m. A tradition in India, the all-night classical concerts are rarely held in the United States and this gives visitors the opportunity to hear ragas (traditional scales or modes) that are rarely performed in public and are only performed early in the morning or late at night. This unique experience will continue through 8 a.m. and will feature more than 10 groups and artists. On Saturday, September 19, Manitoba artist Tanya Tagaq adds her signature style of pulsating breath and Inuit throat singing to complement a screening of the 1922 silent film Nanook of the North. Presented with the Museum of Contemporary Art, this inventive live accompaniment to the silent frames adds a relevant new light to a film about an early 20th-century Inuit community in Northern Quebec. The performance begins at 7:30 p.m. at the Museum of Contempoary Art (220 E. Chicago Ave.). One of the final events of the festival is the popular open house at the Chicago Cultural Center, “One World Under One Roof,” on Sunday, September 20, from 1 p.m. – 7 p.m. Performances take place throughout the building including Preston Bradley Hall and the Claudia Cassidy Theater. Giving visitors an immersive and diverse world music experience all in one building, performances include Chicago guitarist Andrea Kapsalis, Finnish folk group, Kardemimmit and Georgian folk music group Zedashe. The full World Music Festival Chicago line-up will be announced at a later date. For more information, visit worldmusicfestivalchicago.org. The FREE admission World Music Festival Chicago is presented by the Department of Cultural Affairs and Special Events and sponsored by the Chicago Transit Authority, Chicago Tribune, Metra and Millennium Garages. The appearance of La Santa Cecilia, is supported by the National Museum of Mexican Art as part of their annual Sor Juana Festival, a multidisciplinary festival that honors one of Mexico’s greatest writers, Sor Juana Inés de la Cruz, a 17th-century Mexican nun who valued the education of women. The Department of Cultural Affairs and Special Events (DCASE) is dedicated to enriching Chicago’s artistic vitality and cultural vibrancy. This include fostering the development of Chicago’s non-profit arts sector, independent working artists and for-profit arts businesses; providing a framework to guide the City’s future cultural and economic growth, via the 2012 Chicago Cultural Plan; marketing the City’s cultural assets to a worldwide audience; and presenting high-quality, free and affordable cultural programs for residents and visitors.